PLEASE NOTE SOUNDRIDING IS NO LONGER TRADING. "I've been using the Personal Trainer System from Soundriding for my training clinics and it really does make a difference to the level of communication between trainer and rider. The System allows the rider to remain relaxed during the lesson, hearing clearly and precisely detailed instruction, wherever they are in the arena." "I would certainly recommend the Personal Trainer as an invaluable training aid." Want to give your pupils the competitive edge and prevent yourself going hoarse in the process? 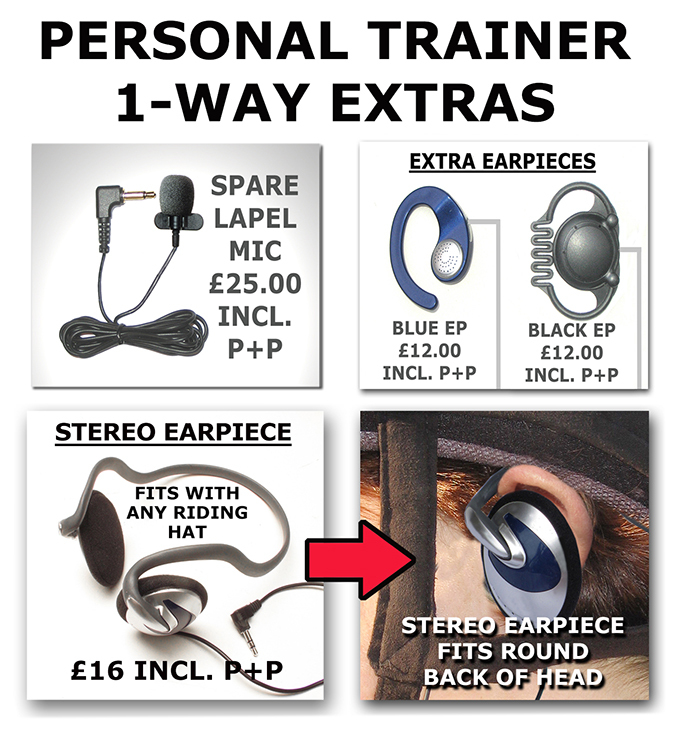 The NEW Personal Trainer One Way Radio Mic System enables you to communicate directly with a student from the sidelines, or in the saddle, and is used by top riders, trainers and international teams. System (shown above) includes transmitter, lapel microphone, receiver, earpiece, USB battery charger (can be used anywhere in the world with travel adapter), charger leads and kit bag. Optimal tested range is 100m. Built-in lithium-ion batteries recharge in 12 hours, providing around 15 hours of continuous use on a single charge. Trainer can mute voice as required. System is extremely small and light weight (units weigh 50 grams each). 3 year warranty on components (battery warranty is one year). The new 40 Channel Personal Trainer One Way Radio Mic System costs £219.00 including free insured courier delivery (Mon-Fri, UK only). We believe this is the best price and value in the UK for the system offered. Please note prices shown are for payment by debit card. Credit cards will incur an extra charge. * Lithium-ion rechargeable built-in batteries (around 500 recharges). © Soundriding.com. All rights reserved MMXVIII.